Next week we celebrate Martin Luther King Day, the American Federal Holiday honouring the life of the great civil rights leader. Despite its date moving from year to year (always the third Monday of January), the day is intended to mark his birthday. I’ve always loved MLK Day -- not only because it falls near my own birthday, but because of the stories and memories I associate with it. My grandparents tell stories of fighting in the civil rights movement, of feeling as though Martin Luther King was speaking directly to them, urging them to write letters, attend marches, and bring together the people of their small farming communities to fight for a better future. And of course, like many Americans of the younger generations, MLK Day brings memories to me of being a child in grade school. I remember watching an old, shaky, black and white film clip of Martin Luther King speaking to a huge crowd of people. I remember realizing that if I was so moved and inspired by his words so many years after he spoke them, they must have been immensely powerful at the time. 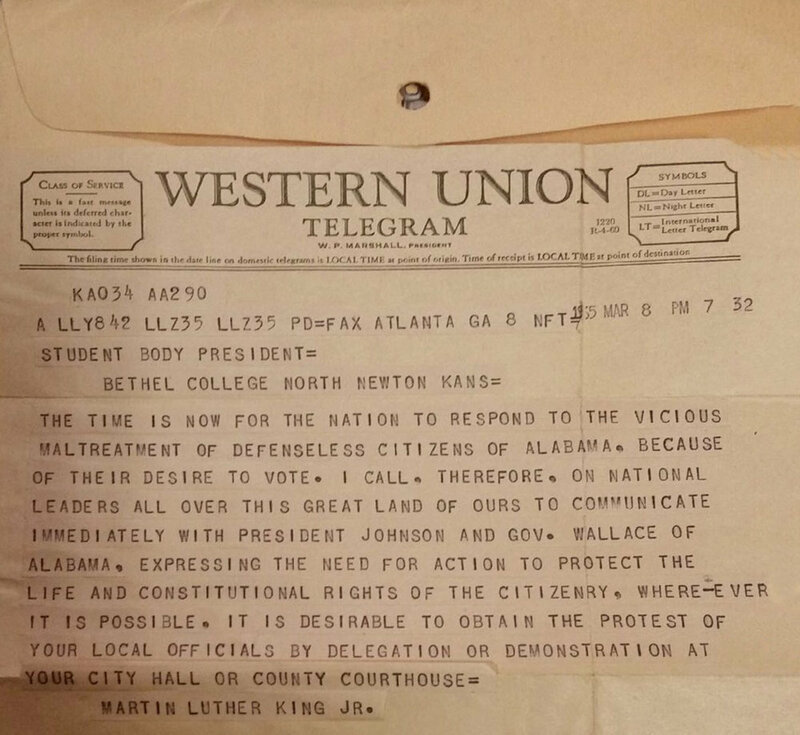 At one point King spoke directly to my grandfather, in the form of a telegram encouraging him to continue gathering the people of his small college to participate in the civil rights movement. 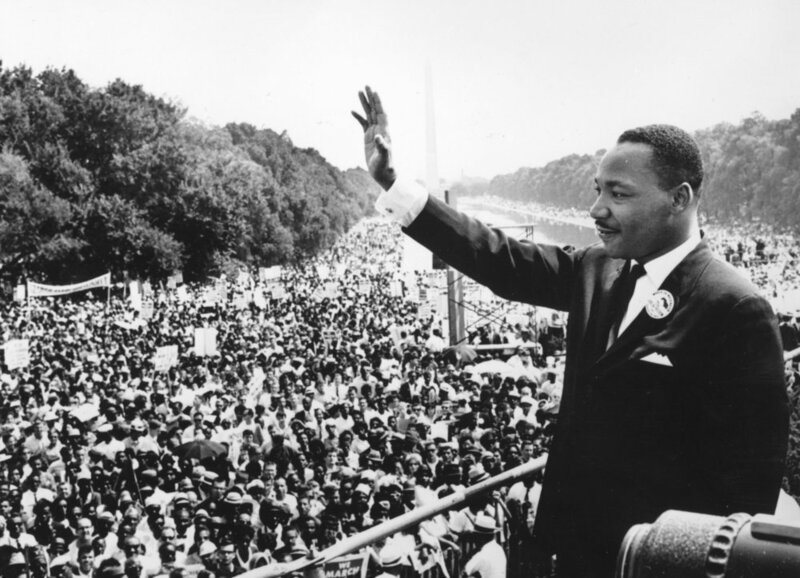 The speech that I remember watching in school was of course the one containing the famous phrase “I have a dream,” which is often used to refer to speech as a whole -- the I Have a Dream speech. This phrase is so powerful on its own that it has since come to define not only the speech it was spoken in, but also King’s approach, message, and movement as a whole. What I never learned as a child however, is that this phrase (and the refrain that followed it) was not part of the script that King had prepared to give that day; it was a “Hail Mary” thrown to uplift a sobered crowd. On August 28, 1963, approximately 250,000 attendees were gathered together for the March on Washington for Jobs and Freedom, intended to show mass support for President Kennedy’s civil rights legislation and to advocate for further civil and economic rights for African Americans. People traveled for many hours from across the country to be present for the march -- they filled buses, trains, and airplanes, converging on Washington DC despite media expectations that the march would be a risky and even dangerous event. The crowd marched from the Washington Monument to the Lincoln Memorial, where they sang and danced, waiting to hear the already-famous Martin Luther King speak. King began his speech with masterful rhetoric, interweaving references to the Emancipation Proclamation, the Declaration of Independence, the Gettysburg Address, and the United States Constitution with anaphora and allusions. His speech discussed the continued hardships and inequalities faced by African Americans, highlighting the distance between the world idealized in these historical documents and the realities of daily life for African Americans. The crowd, previously celebrating to the singing of Mahalia Jackson, was sobered. It wasn’t until Mahalia Jackson, who had seen King speak about dreams before, shouted "Tell them about the dream, Martin," that King abandoned his script and began an improvised rendition of a refrain used in previous speeches -- one about his dream for a better future. As King described a world in which children are not judged by their skin colour and freedom rings from every hill and mountain in America, the crowd cheered; this strong imagery helped them to share his dream. Despite the masterful rhetoric of the first segment of the speech, it is the second segment of the speech that children recognize over 50 years later. 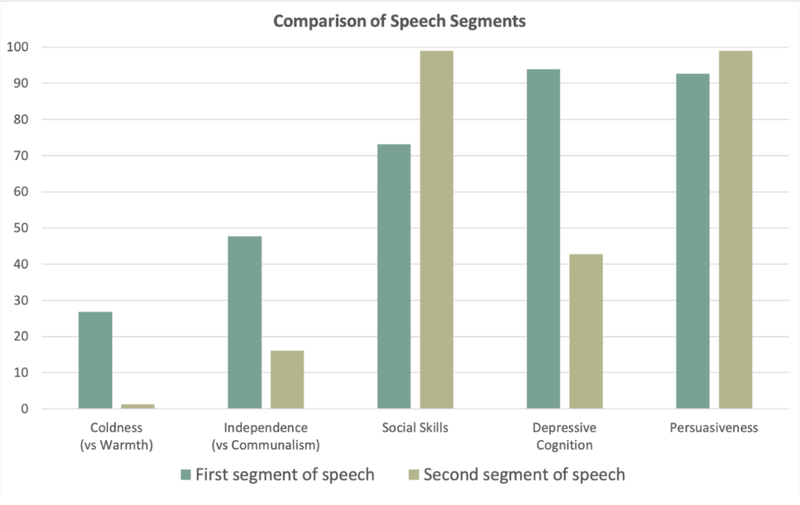 The thematic and tonal shift is clear when we analyze his speech, as seen in the graph below. As King moves into the second segment of the speech, he shows a warmer, more communal, and more socially inviting persona. He also shows a dramatic drop in some thought patterns often associated with depression, such as and focus inward towards the self and a disproportionate focus on negativity and pessimism. Most notably, this shift toward a more optimistic, positive, and warm perspective pushes King’s already high persuasiveness even higher; this shift matches audience impressions of the two segments of the speech both at the time and today. From countless studies in the fields of psychology, business, and political science to Jon Gordon’s bestselling book on the subject, the importance and power of positive leadership has never been so clear -- and King’s historical speech can serve as one of the best examples of this timeless and well-documented phenomenon. In only 1,600 words, King used intellect and emotion to appeal for tolerance and fairness. He established weight and credibility by referencing historical documents, then channeled warmth and positivity by painting a picture of a better world. As we celebrate Martin Luther King Day this year, we reflect on his words, his voice, and his message to Americans and the world on that day in 1963. Who knows how many his words could still inspire, and to what heights -- who knows what dreams may come?